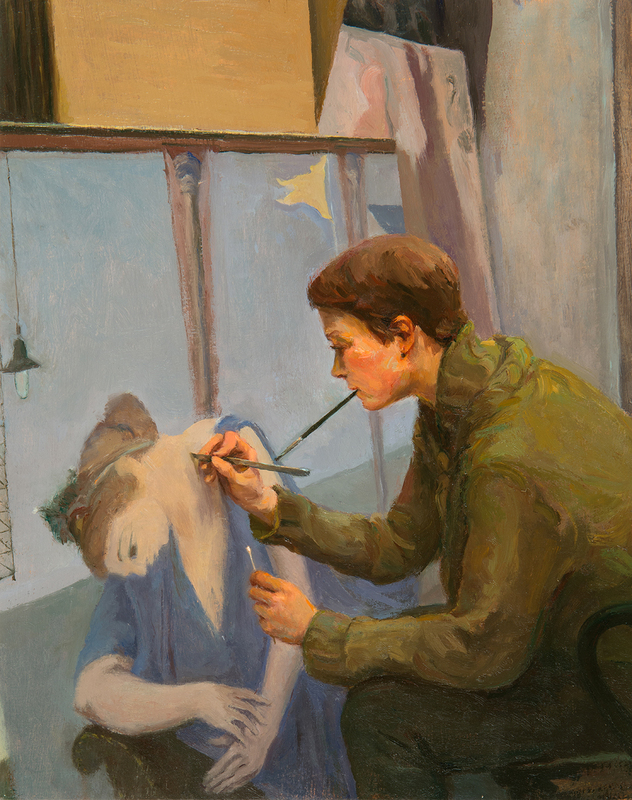 For the first exhibit to reflect his career’s work, artist Gustave Blache III felt coming home to Louisiana was the right fit. Blache grew up in New Orleans and currently lives in New York. Since mid-March, Louisianans have been able to view “A Work in Process: Paintings by Gustave Blache III” at the Louisiana Art & Science Museum downtown. Blache spent much of his career using his artistic voice to call attention to those who normally work behind the scenes, painting portraits of curtain cleaners, mop makers and art conservationists. Museum visitors can expect to see this unique perspective at the exhibit, which also coincides with the Artist Book Foundation’s plans to publish Blache’s monograph this fall. The exhibit and monograph share the same name and span Blache’s career, from his graduate school work to his most recent series about the preservation work done at New York’s Simon Parkes Art Conservation, which debuts as part of the museum exhibit. “Natalie Scrape Cleaning” from Blache’s most recent series about Simon Parkes Art Conservation. While Blache’s work includes still lifes and traditional portraits, his most prominent pieces are his series examining the work of laborers. After doing so many traditional portraits, mostly depicting people’s faces, Blache says he wanted to try something new, and that’s when he transitioned to incorporating workers into their environments. It started in 2003 when he debuted his “Curtain Cleaner” series, a collection of paintings documenting a curtain cleaner working on 20-foot windows in the Brooklyn loft where Blache then lived. “It took on a whole life of its own. It became more about exposing and giving people an access to processes that I don’t think we’re all familiar with and the individuals who do things and contribute to our society that we’re not familiar with, either,” Blache says. The artist continued in this vein, creating his “Mop Makers” series, “Leah Chase” series—of the famed New Orleans chef—and now the Simon Parkes pieces. “I find the most successful exhibition tells a story. The story in this case is focused upon what I’ll call the laborer,” says Elizabeth Weinstein, director of art interpretation and museum curator, about the exhibit. Weinstein worked with Blache to curate an exhibit that is loosely chronological but also split up into his four series. Weinstein finds the work timeless and universal, offering a glimpse of ordinary people engaged in manual work that often goes unnoticed. You’ll also find many of Blache’s canvases in various sizes. When he was in grad school, he would use scraps of other students’ canvases they planned on throwing away after sizing their own pieces. The quirky sizes and horizontal orientations are now something of a trademark for him, and Weinstein imagines museum guests taking their time with this exhibit to examine each piece and its details.